I have a new project/commitment that I will be focusing on. I'm building a team of leaders who are dedicated to having impact, on a large scale, on our society. One branch of that team is going to generate $100,000.00 in international student scholarships for BYU-Hawaii in the next year or so. I believe that mastering the art of running a home and family is the greatest training for leading any organization. That is why I love to read leadership books. While they may have been written for corporate America, they often have themes and principles that enhance the home's efficiency and effectiveness as well. Currently I'm studying Leadership: Great Leaders, Great Teams, Great Results, by Stephen Covey. I love the title because I see parents as being the "Leaders," the whole family as the "team," and the family culture as the "Results." I want to share just one applicable idea that came out of this book. Covey talks about organizations being able to identify their "Wildly Important Goal(s)." Also known as "wigs," for short. Isn't that a great way of saying, "But what's the MOST IMPORTANT goal we have?" Last night as I lay in bed, mentally preparing for today, I started to feel the ever-common emergence of stress and anxiety about how much I "had" to get done by the end of the day. There were so many things to do - scrub the bathroom, laundry, teach the kids, respond to messages, prepare Sunday lesson, etc., etc., and then......I CAUGHT MYSELF. I realized that I was bringing on the "pre-breakdown" syndrome. And I said, "HALT RIGHT THERE!" Then, I referred back to the Covey book - "What is my WILDLY IMPORTANT GOAL?" Followed by the question, "What's the one thing I can do (or do first) that would make the biggest difference in the entire day?" That thought process knocked out the anxiety and stress and suddenly put it all in perspective. It was easy to answer and simple to apply: Teach the kids first - meet their basic needs of their bodies, hearts, minds and spirits. I can clean the bathroom when Sai gets home from work. If I say, "parasites," what do you think of? Foreign countries, right? Returned missionaries who served in 3rd world countries. Guess what? People in the USA have parasites! It is not uncommon or unusual for an American to have parasites. They come from our foods, our water and our pets! Most of the time, these people don't even know it! What they know is that they feel tired, mentally cloudy, and prone to sickness. Why? Parasites consume the nutrients we eat, so nutrition never gets to the organs that need it. Then, parasites deposit their waste inside of us. Not only does this weaken our immune systems, but it causes illness. I recently met a mom who has a daughter that was diagnosed with Autism. Guess what was discovered later??? She had a WORM! A worm, eating all of the nutrition in her body and leaving her depleted. Without health, we really have nothing - no energy, no mental clarity, no physical ability to SAY-GO-BE-DO! Income, travel, education, career, it doesn't really matter if we're losing the greater battle. Are You Toxic? This is why we (the Naivalu Clan) eat super food and cleanse regularly. Today's thoughts while running BAREFOOT (6 miles) was about pain. In my experience, and from some reading, it appears that in general, people in our society fear pain; And those who don't are considered masochistic. David Wood has said, "That which we resist persists." We EMOTIONALLY RUN, from pain because we FEAR it. Where/when did we start fearing pain? Our ancestors, just a generation ago, let alone 2 or 3 knew that pain was a part of life. Have technology and conveniences ... our search for efficiency (as author Chris McDougall says in Born to Run)contributed to this love of ease and fear of pain? Looking at my own experiences with emotional and physical pain, like leaving to go on a mission, natural childbirth, running a marathon, to name a few, have all subjected me to some degree of pain yet yielded life-altering rewards. The rewards all far out weigh the pain/sacrifice. So...why do we fear pain? And what do we miss out on as a result? Where will this take us? This leads me to think about repentance. How often have I spoken to someone who realizes that his/her choices have caused a separation from the Spirit, yet he/she has not attempted to repent because of...... a FEAR of pain, this time emotional/spiritual pain. Weigh the perceived "pain" against the joy of cleanliness, rebirth, love! Is there any comparison? Going back to the physically "painful" experiences, like childbirth - pain is not terrible, it's a type of communication between the physical body, mind, and spirit. It provides information, guides and instructs, alters thoughts, emotions and behaviors; it promotes growth/progess/advancement. THROW AWAY YOUR COMFY RUNNING SHOES! GO BAREFOOT! And get back to basics. Sikeli Naivalu, 5, poses for a portrait in Wagner Park on Monday. 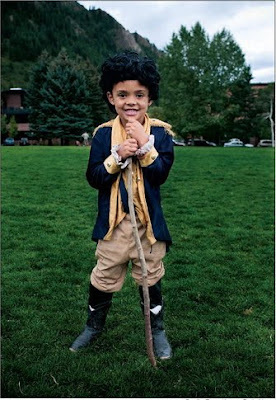 Naivalu, dressed as his favorite historical figure, George Washington, is a history buff and loves to go to the PItkin County Library. Still reading Born to Run, by McDougall. I can't believe the case he makes correlating injuries and running shoes. Yesterday I told Sai that I was going to run barefoot. "Are you crazy?" He said. "Now that's funny," I responded, "How old were you when you got your first pair of shoes?" "8 or 9." He responded. "Does everyone in Fiji wear shoes?" I asked. "Ya, well, they've been doing it all their lives." He retorts. "Well, then, I guess it's time I start." I concluded. This morning at 5:30 a.m. it was cold. I walked across the street, carrying my shoes, apprehension flooding over me like a tidal wave. I recognized the fearful thoughts in my head, "I don't know how to do this!" Then quickly contradicted the imposter in my mind, "Of course you do...you were born to run!" The ground was wet from rain. Yet almost instantly, as I began to run, I felt like a child, playfully meandering through the playground. It was easy and fun. Our society has killed the natural love for running by making it competitive and painful (through "technology" and "running shoes"). Everything I'd read about Barefoot Ted in Born to Run was right on. My foot just knew what to do to avoid rocks and pokies. I naturally improved my posture and speed. And, did I mention, IT WAS FUN! I've decided I'm going to train barefoot a few days a week. And when I'm with my kids, I will not use the phrase, "Slow down, don't run." If they start to run, I'll run with them. I want them to know that running is natural and fun and that we are built to run. This is so fun and so freeing. I challenge YOU, if you hate to run, GO BAREFOOT and revive your childhood joy! This past weekend I was able to spend time with my husband! What a concept! We (along with nursing baby, Josaia) went to Anaheim. We had a weekend packed full of new friends, new information on nutrition and new motivation to succeed in life. Hearing from doctors, nutritionists and individuals on the topics of our environment, our food, and our bodies, has excited us more than ever to get the best into ourselves and our children. Here is a photo of me at the convention. May I just say that I gained 50 lbs while pregnant. Josaia is 4 months old. I have never gotten rid of baby weight this fast - nutritional cleansing works. And, I've never had so much milk for the baby! Breastfeeding this time around has been totally different from any of the other 3 boys' experiences. Just look at chunky monkey Josaia! Here we our with our friend, Ryan Rhoades, who weighed nearly 500 lbs at the beginning of this year. Ryan has lost 163 lbs in 8 months - no joke. He won 2nd place, $2,000.00, in a fitness challenge. We are SO proud of you, Ryan!!! His whole life has changed! More than anything, we were INSPIRED by life changes - health and weight are inevitably interconnected to accessing human potential. We beleive that physical self-mastery is the doorway to achievement, impact, and joy. When we are physically limited, we become mentally, emotionally and financially limited. Many people in our society are losing sight, losing hope, of dreams. People don't really dream anymore. The "American Dream," is more of a long, lost legend than a reality. It doesn't have to be. We are living our dreams and we are committed to being DREAM-MAKERS, helping others to rediscover and live their dreams too! I was JUST getting to the point of no return when it comes to my frustration with CDs! I love having kids songs and audio books to play in the car and at home, however, it seems no matter how hard I try to protect the CD's, they scratch within months. I've tried copying them and keeping an "archive" original, yet WHAT A HASSLE! I love what they learn from audio books and how their creativity and thinking emerges, (in contrast to TV). It introduces them to more classic stories and lessons and values being taught in age appropriate language and broadens their interests. At the library this week, I discovered that they carry Playaways. Are you all onto this already? If not, check this out! It's a digital book! No skipping CDs, no cassettes, just a book. Plug in the headphones and take it anywhere. You can check them out at the library...or, I just discovered that you can rent them via the mail! This is incredible! I am SO signed up for 3 books at once - my running has just been revolutionized! Think about it...I can run AND LEARN at the same time! I am SO JAZZED! A New, Competitive Sport - Couponing! Did you know that "couponing" is a verb? A few months ago, while in Utah, I was able to attend a Coupon Class. If you haven't jumped on board with this yet, let me just say there is absolutely no reason why every LDS woman isn't doing this!!! Internet has made the whole coupon world so simple. Did you know that Safeway stores allow you to upload coupons right onto your store's discount card - no cutting, saving, etc. They just get redeemed whenever you buy the certain item and they're automatically deleted when they expire! I can't wait til every store operates like this. Ok. Utah people, get with Jodi Gardner and clan. She'll teach you at your home, or at an enrichment, and it's so fun and easy. Here's the direct website, but Jodi will help you navigate it and understand this. By using your grocery savings and applying it toward credit card, car, student loans, etc., you can move toward being debt free even quicker! 2 - Building Food Storage - Hello! Am I the only one who knows in my heart that this is so important, and yet, do I have a 2 year supply? So imagine if Mac and Cheese only costs you $.09 per box on a sale day b/c you have a coupon. Could you get a 6 month supply of it? What if toilet paper is free this week? You can build your food storage FAST without spending a dime more to do it! 3 - CHARITY - true self-reliance means being in a position to help others, I believe. When Coupon Class Lady, Jodi, mentioned how she donates loads of items to the Boy Scouts' Food Drive, to homeless shelters, for Christmas food drives, and even to her niece who is a "poor college student," the light bulb went on. If you have loads of household items like toothpaste, shampoo, cleaners, and food, are you not totally in a position to help anyone who is in need? As I am a greenie at this - I would love any veterans to share their pearls with me. And I challenge YOU to join me in seeing who can save the most this month - LET THE GAMES BEGIN! I was so inspired by my dad's "Tractor Square Dancing" that I felt it was time to take my boys back to where it all began. My dad was raised on a ranch near the Beaver Dam State Park in NV. It's been years since I've been to the ranch, and my boys have no memory of it. So this past week we convinced grandpa to take us to the ranch for a few days. No cell phone service, no internet, no traffic....just nature. It was an "ah-hah" for me. So many of us discuss the growing, yearning desire to live more simply, more healthily, more happily - yet we continue to live day to day in an ever increasing state of chaos and "busy-ness." I believe this desire is part of the collective unconscious - a trend occuring throughout society, yet many are unaware of what they're feeling and worse yet, unaware of what they can do about it. So what can we do about it? Just get in the car and GO! (Okay, it may help if you HAVE a ranch to go to...:) It was SO freeing. The peace and stillness of the ranch was conducive to a peace and stillness within me. It opened the channels of inpsiration and put my children into focus as the priority, over other time demanding/consuming "necesseties" of my typical home life. We stopped by the Hafen ranch on our way to the Mathews ranch. Let me just say, I was overwhelmed. I have known these people all my life - in fact, our families are currently in their 5th generation of sociality - one with another. However, on this trip, I was impressed by the thought, "This is what's meant by 'salt of the earth.' These people are truly that!" Here are my boys at the Hafen ranch in front of the old school house where their great-grandpa Mathews attended school. Here are some photos of a great-grandpa Hafen entertaining my kids as if they were his own. Love you people!!! Then at the Mathews' Ranch we leared all about our grandpa's upbringing. My boys had a great time - Thanks Grandpa! My dad was raised on a ranch. He wears wranglers and western cut shirts, everyday. He wears "nice" boots to church. He watches RFD TV (never heard of it? Consider yourself LUCKY!) He recently retired and with lots more time on his hands he has been becoming more and more savvy with his internet skills - as a result of some tutorials from my brother. My dad's favorite site is Youtube. I find my children sitting with my dad watching the most interesting (sarcasm there) things. When I ask him what he's exposing my children to, he replies, "They're gettin' cultured." Here is one clip I just couldn't resist sharing with you. This is the type of "culture" we get in my house. This friend of mine, a mom, a photographer, has gone from having a photo hobby to putting out images that look like a high end fashion magazine photographer!!! Sanae - your work is AMAZING! Where were you when I needed a family photo shoot??? I want to hear comments from what you all think - I really can't believe that she is an "amateur." The word, "Empowerment," to me, is not a neo-nazi-feminist word that should scare anyone. It simply means: to have the ability, and permission, to accomplish something. Disempowerment is the opposite - it's when the environment is controlled by a dominating force which suppresses the individual's agency. I believe that at times our own choices disempower us - we give our power away to external forces - and live a far less effective, less satisfying, less impactful life, than we could. I love Victor Frankl's own example from his experience inside of a Nazi concentration camp, detailed in "Man's Search for Meaning." He teaches that while "liberty" (your ability to move about at will) may be controlled by others, "freedom" is completely up to you - it is a state of mind. Through this type of "freedom," empowerment emerges. I believe in empowerment - as a principle. I want to empower my children to have and use their inner compass - to have the character to act with integrity and the self-worth to overcome sin. I want to empower my husband to feel comfortable in his greatness. I want to empower my friends to live their dreams. I want to empower LDS women to be truly happy by shedding limiting beliefs about perfectionism. I want to empower women everywhere to accept their beauty and potential and to not play small. In order to do any of this - I must first empower myself. Homebirth was a powerful experience that added to my sense of empowerment. I was able to create a birthing environment that gave me permission to do, say and feel anything I wanted to, anything that felt natural or necessary. I was not inhibited in the least. It provided me with the space to maximize my OWN abilities and strengthen my faith and reliance on the Lord. Another empowering experience is marathon running, and since I just REGISTERED FOR THE ST. GEORGE MARATHON, coming up in October, I wanted to highlight this empowering endeavor by sharing one of my favorite clips. I believe that empowerment evolves from sacrifice and pain because they are intrinsically linked to triumph, success and greatness. 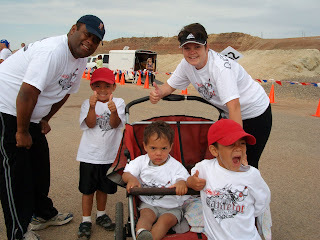 Here is a look at why 5 people run - it hits home for me. My favorite line is..."anyone who walks away from this, walks away from the obvious." (may be paraphrased). Really, truly, if we don't have our health, what do we have???? 1 - Do I know ANY family that doesn't have at least 1 person with a preventable/degenerative health condition? 2 - Do I know why my kids' immune systems are so low? (Why they repeatedly have colds and coughs). 3 - Do I know what is in the water I drink? 4 - Do I know where my foods come from - where and how they're grown? 5 - Do I know what hormone injected cows and chickens do to my body and my kids'? 6 - Do I see the increase in disease within our society, affecting kids at a younger and younger age? 7 - Do I get that it is an environmental issue - that "toxins" are real? 9 - Is it true that obesity just surpassed tobacco as a leading killer in America? 10 - Is it really that common for kids to have bowel/constipation problems? (I thought it was just my kids). I find more and more moms becoming educated and concerned about these things. I want to learn from any of you - what do you know and what are you doing about it? Here are glimpses of the first moments that each Naivalu boy had with their new baby. We introduced each of the older brothers, one at a time, so they could spend some time just with mom and baby alone. Each one was in awe of their new little brother. When it was Aisea's turn, he entered the room and said, "Oh my goodness, it's a BABY!" Pictured below are the "Birthing Team" members - Grandma Mathews & Liz - the midwife, Sai, Angie & Anja.